Keeps up with your busy work environment. 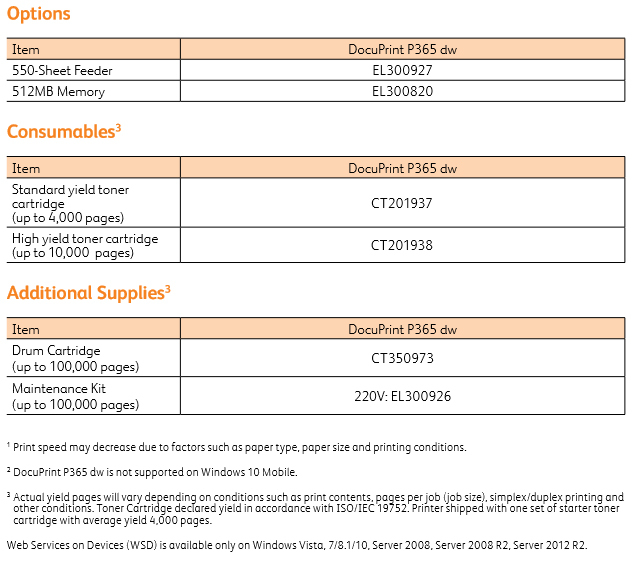 With a print speed of 38 pages per minute and 5.2 sec first page out time, the DocuPrint P365 dw has the performance to keep up with your busy work demands. Printing multipage documents is a breeze with automatic two-sided printing. Superb image quality. 1200 x 1200 dpi resolution with genuine PostScript® 3™ ensures accurate print output with incredible detail and clarity. Scalable options to meet demand. The optional 550-sheet feeder extends the total input capacity to 850-sheets, meaning you’ll spend less time reloading paper and more time getting on with business. Flexible print options. From thick paper, card stock or labels; achieve crisp print results everytime on a variety of stocks. This allows you to print more inhouse – saving you time and money. Fast networking. Gigabit Ethernet enables fast communication between the printer and the network, ensuring you achieve the best performance out of your printer network. Easy connectivity. 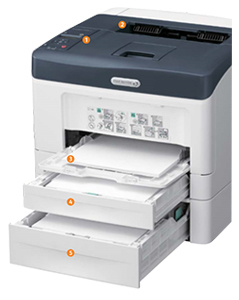 Wireless enables the DocuPrint P365 dw to be connected to your network without the need of messy cabling. This also gives you the flexibility to position the printer anywhere in the office and allows a workgroup to share without an expensive network setup. Improved duty cycle. 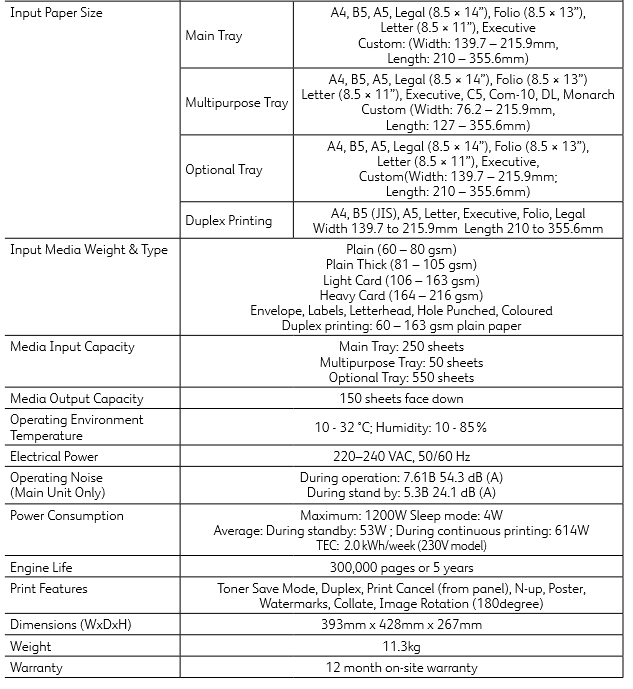 The Fuji Xerox brand is renowned for its technological advancements in creating reliable business printing products. The DocuPrint P365 dw features an improved print engine delivering an increased duty cycle, backed with a convenient on-site service warranty. Less disruption with high yield toner and drum. With a high capacity toner cartridge and long life drum, you can print for longer without the need to stop and replace cartridges. Dual consumables. Unlike most laser printers, the DocuPrint P365 dw utilises a seperate toner cartridge and drum unit allowing you to achieve the maximum use out of each component. This delivers significant cost savings. Toner saving feature. Which gives users complete control of toner usage by selecting a mode that is most suited to the output that is required. For instance, when printing documents for internal use, you may want to use the lightest setting for maximum toner saving. EA-Eco Toner. Our EA-Eco Toner with low-melt technology achieves minimum fusing temperature at 20°C less than conventional toner for significant energy savings. Certified energy efficient. 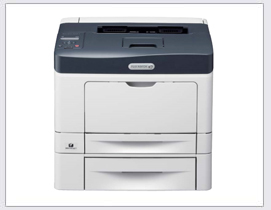 The DocuPrint P365 dw carries the international Energy Star 2.0 label. Energy Star is a voluntary labelling program designed to identify and promote energy efficient products that reduce greenhouse gas emissions. Keep up with demand. The optional 550-sheet paper tray extends the the total input capacity to 850 sheets - meaning busy work environments can spend less time re-loading paper and more time getting on with business. Advanced security features such as SecurePrint*, Control Panel Lock, IPsec data encryption and IP filter ensures encryption of confidential material for transmission over a network and is only printed when a password is entered on the control panel. Enterprise-wide operations put you in control Extend your LAN to WAN. 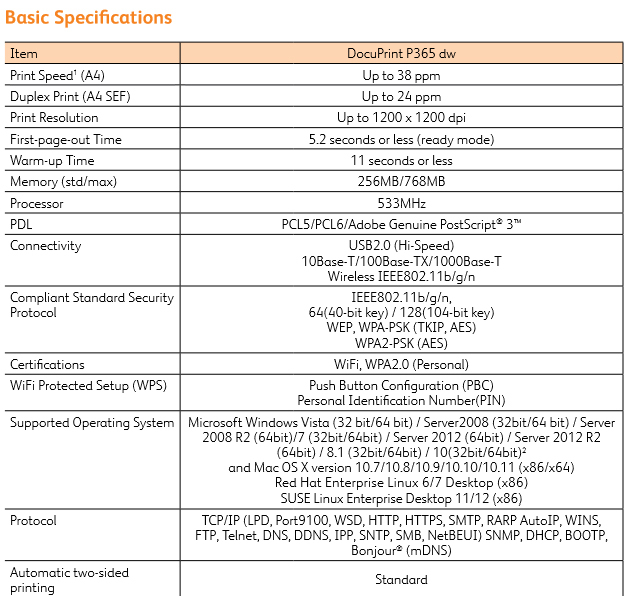 The DocuPrint P365 dw is supported for wide-area network printing in enterprise business applications, providing the same feature-rich environment as when printing over the office localarea network. Expanded Citrix printing. The print utility for XenApp has a number of new features and provides enhanced usability and improved administration for Citrix printing. Good news for SAP users. The ApeosWare Device type enables the DocuPrint P365 dw to be used in SAP R/3 or mySAP environments, helping create beautifully formatted reports, forms and barcodes, and simplifying administrative tasks. Centreware Internet Services (CWIS). CWIS function allows for easy setup and monitoring of the printer on the network. The software also generates email alerts that notify of events that require attention, such as low toner levels.